The Biomedical Engineering Shuttle runs between NC State’s Centennial Campus and UNC’s School of Medicine Monday through Friday, 8:00am – 5:00pm. 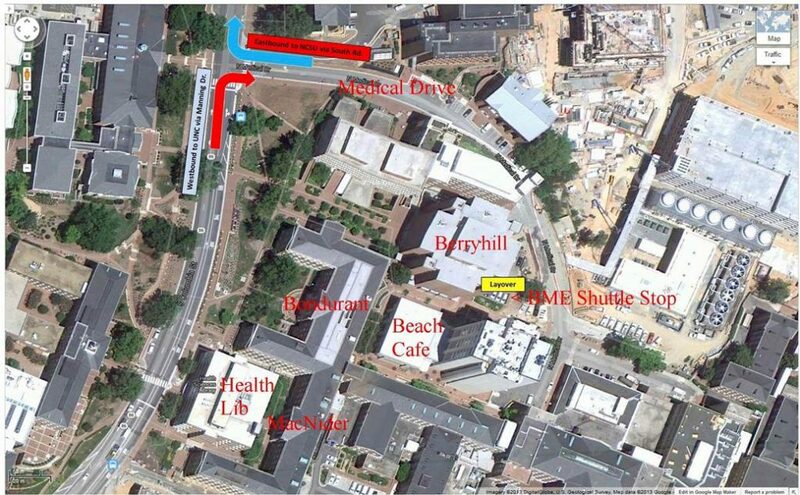 The bus departs from NC State’s Centennial Campus (on Oval Drive, adjacent to the Engineering Building II breezeway) on even hours and from UNC’s School of Medicine (from the Medical Drive parking lot directly behind Berryhill Hall loading dock and adjacent to Brinkhous-Bullitt (Beach Cafe) on odd hours. All UNC-Chapel Hill and NC State students, faculty, and staff are eligible to ride for free. Eligible riders only need their NC State or UNC-Chapel Hill Campus ID cards for easy identification by shuttle drivers. BME department members with ID sticker will receive seating priority. To get your sticker, email Catherine Matthieu or either drop by 9012 Mary Ellen Jones Building at UNC or 4134 Engineering Building III at NC State (see Andi Scheer). The shuttle accommodates up to 14 riders. Please note, reservations are not required for riding the bus.